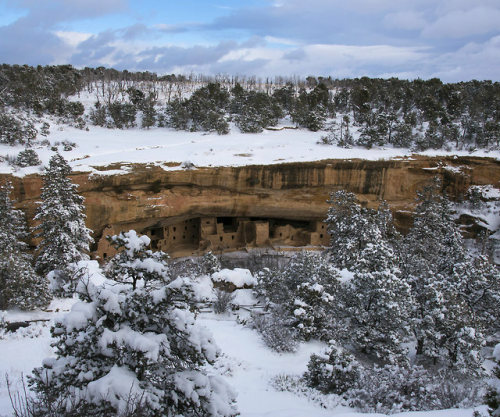 Mesa Verde means “green table,” but winter snows have turned… – Sig Nordal, Jr.
Mesa Verde means “green table,” but winter snows have turned most of Mesa Verde National Park white. Over 5,000 archaeological sites in the park help tell the story of the Pueblo people, who lived more than 700 years ago in what we now call Colorado. Spruce Tree House, seen here, is one of the best preserved cliff dwellings in the country and an astounding sight from Chapin Mesa overlook. Photo by National Park Service.